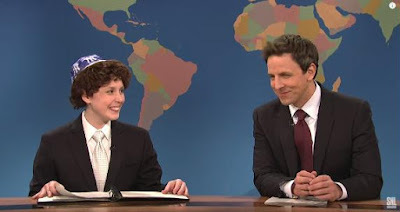 One of our favorite characters on Saturday Night Live is Jacob the Bar Mitzvah Boy, played to perfection by actress/comedian Vanessa Bayer. Despite Seth Meyers’ best efforts, Jacob the Bar Mitzvah Boy (Vanessa Bayer) can’t break away from his prepared speech about the miracle of Hanukkah... which is almost as big a miracle as his mom leaving a sale empty-handed. This skit is from 2013, Vanessa's third year as a cast member. With this video clip, we continue our funny Chanukah-themed videos and also add to our Throwback Thursday collection. A SPECIAL NOTE FOR NEW EMAIL SUBSCRIBERS: THE VIDEO MAY NOT BE VIEWABLE DIRECTLY FROM THE EMAIL THAT YOU GET EACH DAY ON SOME COMPUTERS AND TABLETS. YOU MUST CLICK ON THE TITLE AT THE TOP OF THE EMAIL TO REACH THE JEWISH HUMOR CENTRAL WEBSITE, FROM WHICH YOU CLICK ON THE PLAY BUTTON IN THE VIDEO IMAGE TO START THE VIDEO. A Joke to Start the Week: "Fifty Bucks"
A Joke to Start the Week - "The Mother-in-Law"